In front of one of the best home crowds the team has seen this year, Georgia State fell 81-68 to Texas State (17-3, 6-1), who took over sole possession of first place in the Sun Belt Conference. The loss stands as only the second conference loss this season, the first coming against Troy on the road. The Panthers started the game with what head coach Ron Hunter defined as “low energy” and trailed 10-2, prompting Hunter to call a timeout less than three minutes in. The game was defined by Texas State’s fluid, efficient offense. The Bobcats moved the ball with precision to open shooters as they shot 47 percent from the field and 44 percent from long range and tallied 18 assists for the game – Georgia State ended with 11. The fourth-ranked team in terms of assists in the Sun Belt showed why they have been successful in that regard all season. In the second half of the game, the Bobcats used a four-minute, 18-0 scoring run to go up by 20 and put the game out of reach after the Panthers were only down by two points. Seniors Jeff Thomas and Devin Mitchell carried the load for the Panthers in the game scoring 19 points and 20 points respectively. Thomas and Mitchell combined to make nine of the Panthers’ 11 made 3-pointers in the contest. Before the loss to Texas State, the Panthers had not lost to a conference opponent at home. The Georgia State Panthers (15-6, 6-2) “fought” for a 77-71 win against UT Arlington (9-12, 5-3) Saturday night with D’Marcus Simonds playing only three minutes in the second half. The team’s leading scorer sat out much of a closely contested second half as he dealt with the “pressures of the game” according to Hunter. Georgia State led the game in the first half by as many as 15 before the Mavericks used a 17-2 run to tie the Panthers with 29 points at the half. The Panthers were coming into the game riding a season long two-game losing streak at home and have seen their grip on the conference lead ceded to Texas State. Thomas contributed 27 points on 11-of-15 shooting and missed only one of his six 3-point attempts. Sophomore Kane Williams scored 14 points and served out four of his five assists in the second half. With Simonds on the bench, Williams led the way defensively with two steals and made sure the Panthers operated efficiently in the half-court. Georgia State’s women’s basketball (10-8, 4-4) traveled to Texas to compete against two conference rivals – Texas State and UT Arlington – last week. The Panthers didn’t let up against the Texas State Bobcats (9-11, 4-4) on Thursday night as they prevailed over them 57-34. In the Texas State win, Allison Johnson led Georgia State in scoring with 19 points, which also stood as the senior’s career high in points. Jada Lewis added in 14 points of her own and helped the team set the tone on the defensive end with two steals. 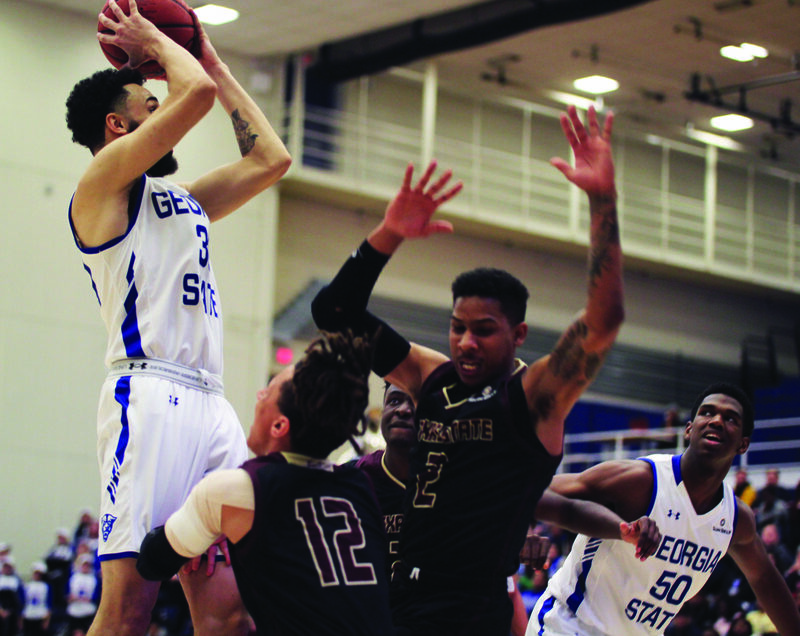 Texas State played an uphill battle against Georgia State for much of the contest, particularly in the second quarter where the team could only produce two points as the Panthers poured in 20 points of their own. Georgia State led for more than 29 minutes of gameplay and limited the Bobcats to 27 percent shooting from the field and 0-of-10 from 3-point range. The Panthers had an eight-rebound advantage over the Bobcats, 41-33, with Johnson leading all players with nine rebounds. After coming off one their most dominating wins of the season, the Panthers continued their Texas play with a matchup against third place UT Arlington (14-5, 6-2) losing 69-45. With the second-best conference record in the Sun Belt, the Mavericks were looking to improve their record by beating sixth place Georgia State at home. The Panthers began the game with a 15-6 deficit after the first quarter. The Mavericks took advantage of their position to build a lead as big as 24 points. Jada Lewis and Madison Ervin scored 10 and 16 points respectively, and they were the only Panthers to score in double digits. Johnson, who came into the game off a career night in terms of scoring against Texas State, added nine points on only 3-of-8 shooting and five turnovers. Bench play served one of the major differentiators in the game. The Mavericks’ bench was able to produce 25 points, while Georgia State’s managed only two for the entire contest.